Sandra Bullock encountered a stalker who broke into her Los Angeles home. Sandra Bullock is accustomed to being in the news for her exceptional acting performances in movies such as “The Blind Side”, and the sci-fi thriller, “Gravity”. However, a recent incident at Bullock’s home in Los Angeles landed her on the front page of media sites for reasons she would prefer to avoid. Sandra Bullock’s stalker broke into her home. Bullock was the victim of a stalking incident, when a strange man managed to gain access to her property and her home. On the morning of June 8, 2014 at approximately 6:30 AM, Bullock was asleep in her bedroom on the second floor of the house. She woke up when she heard strange noises coming from the exercise room. The exercise room is on the third floor of her house. She got out of bed and went to determine the source of the noise. When she walked into the workout room, she saw a man wearing a sweatshirt and pants (maybe he was there to work out?). Bullock immediately ran out of the room, locked the door to the room and called the Los Angeles police department. It took only minutes for the LAPD to arrive and apprehend the intruder. The stalker was 39-year-old, Joshua James Corbett. Upon apprehending Corbett, law enforcement officials found numerous photos of Bullock in his possession. In addition, he had a letter describing himself as her husband, and a weapon permit. Upon inspecting Corbett’s home, authorities found several illegally obtained weapons. As a result, the police filed a total of 19 felony charges against the stalker. In addition, the police found several letters addressed to the actress. The letters professed his love for her and her young child. Also, he revealed that he was present at the American Film Institute gala. The gala was just three days prior to the incident. Authorities also found that Corbett rented out a hangar at the Bob Hope Airport where he had a small aircraft. However, the lease on the hangar was due to expire soon, and Corbett had recently received eviction notices. Since the incident, investigators determined that Corbett managed to evade the security measures at Bullock’s residence. He did so by scaling two gates and then forced his way through a glass door in the house’s sunroom. It is still not certain how long Corbett was on the property. Also, the stalker revealed to the authorities that he had no intention of harming the actress. He simply intended to expose the inadequacies of her property’s security system. It seems he accomplished that. Unfortunately, he also exposed the inadequacies of his understanding of the law. This is certainly not the only celebrity stalking incident to hit the news recently. A number of celebrities including Selena Gomez, Halle Berry and Shawn Johnson. Also, former American Idol contestant Scott McCreery was a victim of a stalking and break-in incident. Earlier in the year, Selena Gomez’s lawyer released a statement condemning the intrusive media coverage celebrities must endure. He stated that it was the primary cause for the development of these obsessive psychological conditions. The lawyer also made a plea to criminal prosecutors to take stronger actions against such offenders in the future. While the media continue to debate the incident, Bullock has yet to release an official statement. Do you have a stalker? Are you nervous and unsure about what to do? 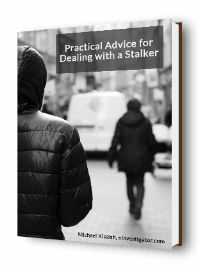 Download this eBook to get practical advice for dealing with a stalker. It provides a simple, step-by-step plan that you can use to keep yourself safe. It includes advice for involving family and friends and reporting incidents to the police. Plus, it has info on running a background check and personal protection measures. The eBook comes in PDF format and is available for immediate download for just 99 cents. If you have any questions about Sandra Bullock’s stalker, please leave a comment below. Also, get the scoop on more celebrity drama. Check out more Celebrity Investigations. Also, read this List of Tips for Dealing with a Stalker.